I don’t know how this dish escaped me for all these years, but I never even heard of this Sichuan classic until a new Chinese restaurant opened up down the street. I have a thing for cheapy Chinese, so I wandered into the Sichuan Spice House wondering what, if anything might be good there. When I opened the menu I was astonished: Tripe. Spicy wontons. Lamb with cumin. Crispy fish served whole. And this twice cooked pork belly. Wow. Real Chinese, I thought. When the food came, I was stoked: Real-deal Sichuan cooking in my little neighborhood! Since then I’ve eaten their twice-cooked pork belly dozens of times. Fatty yet meaty. Super savory from black beans, all brightened by lots and lots of leeks. What I liked the most was that the cook decided to use even the tougher green part of the leek, which most cooks use only for stock; the green parts give the dish a contrast in texture and are stronger in flavor than the white parts, as you might expect. So when I got a whole bunch of wild boar meat from my friend Steve on a hunt we did last September, one of the first things I checked was the belly. Woo hoo! Fat enough to make this dish! My recipe is an amalgam of several, but I am especially indebted to my friend Kian Lam Kho over at the Red Cook blog. 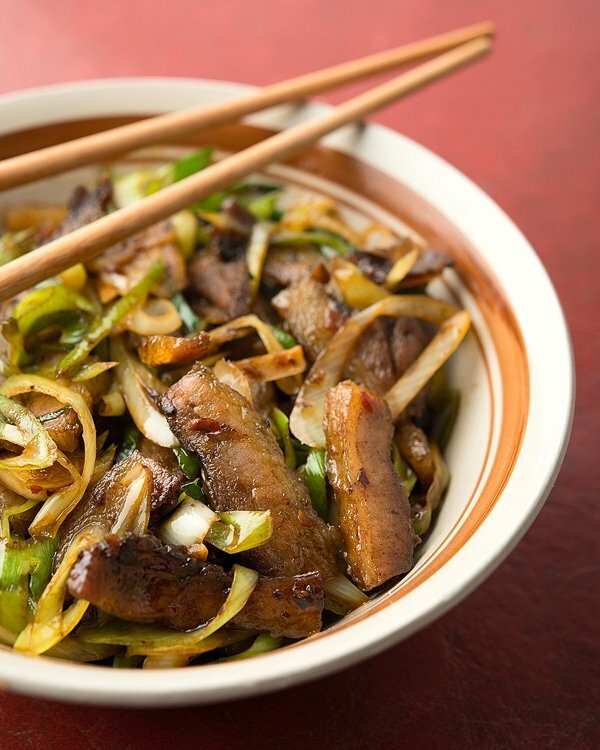 His website is a treasure trove of real-deal Chinese recipes. Cooking twice-cooked pork belly with a wild pig is a little tougher (literally) than if you use domesticated pork belly. Most recipes call for boiling the pork belly for 20 to 45 minutes, but that won't work with wild pigs. Instead, I cook the boar belly in steaming water -- not boiling -- for 60 to 90 minutes, to help break down the connective tissue in it. Keeping the temperature lower prevents all the fat from boiling out of the belly. 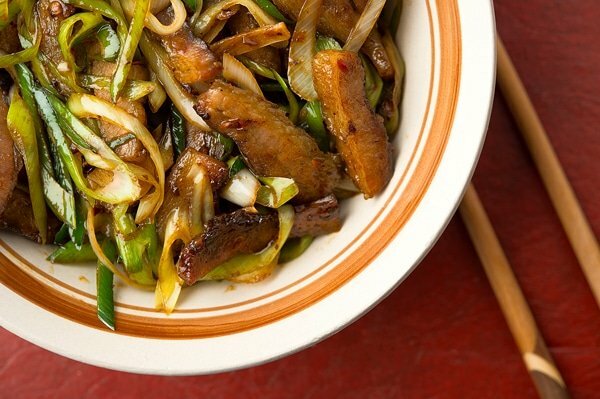 You really need the black bean sauce to make this dish -- many good supermarkets carry it. Bring a large pot of water to a boil and add a healthy pinch of salt to it. Drop the pork belly in it and lower the heat until the water is barely simmering. Cook domesticated pork belly like this for about 45 minutes, or wild pig belly for up to 2 hours; somewhere around 90 minutes is normally about right. Remove the pork belly and set on a plate in the freezer to chill. When the pork belly has chilled through, which should take 30 to 60 minutes, slice it thinly across the grain. You want thin squares or rectangles you can pick up with chopsticks. Heat a wok or large saute pan over high heat until it's good and hot. Add the peanut oil and swirl it around, then add the pork belly. Arrange the pork belly in one layer all around the wok and let it sear like this for a minute or two, until it gets a little browned and starts to release some fat. Toss to flip and use tongs or chopsticks to make sure the pork is cooking on the opposite side. Let this cook for a minute or two. Remove the pork for now. Add the chile bean paste, black bean paste, cooking wine and leeks. Stir-fry over high heat until the leeks are bright green and glossy, about 2 minutes. Add the pork back and stir-fry another minute. Add the cooking wine, soy and sugar and stir-fry another few seconds. Serve over rice. Laurentius: Clearly you have a limited knowledge of Sichuan cooking. 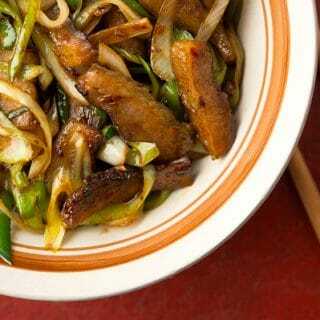 This recipe is directly from Sichuan sources. Ha! I just happen to have some pork-belly left from our hunt in Texas in May! Been wondering how I’d use it!